I’m a total nut for (some) rewrites of Jane Austen’s novels. As I’ve blogged about before, I love Susan Kaye’s rewrite of Persuasion from Captain Wentworth’s point of view and Pamela Aidan’s rewrite of Pride and Prejudice from Darcy’s point of view. But I’m also a bit of a purist when it comes to my Austen rewrites. I’m not interested in rewriting the novels’ plots — no alternative endings. I’m also not a fan of the next generation type novels — Darcy and Elizabeth’s daughters, for example. And I’m definitely not a fan of time travel Austen novels — Elizabeth coming to the present or a contemporary woman traveling back into the novel. I’m a firm believer in the idea that, if a novel doesn’t grab me pretty quickly in the opening page or two, it’s not going to appeal to me so I don’t read it. (This often has as much or more to do with my disposition at the time than the novel — a book that doesn’t appeal to me at one point in time might be perfectly fun to read 6 months later, for example.) What I liked about this opening paragraph is that it could have been a straight rewrite of Pride and Prejudice rather than the beginning of a vampire novel. It signals that Jeffers knows what she’s doing. By that I mean that what I admire most in the rewrites I like is that they capture the spirit of Austen’s fiction. They immerse the reader in the same milieu as the original novels. I also like when this immersion is deep and rich — not just a quick, shallow retelling of the same plot from Darcy’s or Knightley’s point of view. I want a combination of the original and something new and interesting. In the early 1600s, Ellender D’arcy set her cap for Lord Arawn Penningham, and the young man easily fell in love with her; but Léana, a beautiful muse of a vampire, known to offer inspiration to young artists, chooses Lord Arawn for her own. However, Penningham triumphantly resists her temptation and, ultimately, makes Léana his slave. Outraged, Léana seeks the help of her Baobhan Síth sisters, and a curse is placed on the young couple. Arawn’s descendants will forever be looking enviously at the D’arcys, and they will never achieve the same kind of greatness. In addition, the Baobhan Síth will take Arawn’s life. Jeffers begins her novel adhering fairly closely to her original source: after saving Georgiana from Wickham, Darcy accompanies his friend Bingley to Netherfield, where he meets and falls in love with Elizabeth. Their verbal sparring sends off sparks until Wickham arrives and throws a wrench into the works. It’s at this point that Jeffers chooses to depart from the plot of Pride and Prejudice, creating a totally new narrative path in which Elizabeth and Darcy marry much earlier, causing Wickham to exact revenge by turning Lydia into his vampire slave. Elizabeth and Darcy then have to confront Wickham and rid the world of his vampiric menace. As I hope this brief summary begins to convey, Vampire Darcy’s Desire is an action-packed, suspenseful novel. I really like Jeffers’ incorporation of Gothic elements. As she notes in her preface, Austen was writing at the height of the Gothic novel craze (and satirized it in Northanger Abbey), so it makes sense to recast her narrative in Gothic terms. On the whole, this recasting really works. There are a couple of ways in which Jeffers’ narrative falls short, however. Throughout most of the novel, Elizabeth is portrayed as a strong, independent woman; this is one of the aspects that draws Darcy to her. It’s therefore frustrating later in the novel when she has to keep fighting Darcy to let her fully participate in their vampire hunting activities. It doesn’t feel consistent. In this vein, there is also a moment that initiates the last section of the novel in which Elizabeth and Darcy are separated. This plot device feels like just that, a plot device meant to separate them rather than an organic turn in the novel’s action. It’s a little too much like a similar moment in Samuel Richardson’s 1740 novel Pamela. Again, it doesn’t feel consistent with what we know about Elizabeth and Darcy’s relationship. And finally, one side effect of departing from Austen’s original plot so early in the narrative is that we never get to meet Mr. Collins or Lady Catherine, which is a real shame. I would have liked to see what Jeffers could have done with these characters and the vampire plot. Despite these problems, I thoroughly enjoyed Vampire Darcy’s Desire. It’s a fun page-turner that envelops us in a Gothic version of Pride and Prejudice, a kind of Twilight for Janeites! I liked Jeffers’ writing so much, I bought her older straight rewrite of Pride and Prejudice from Darcy’s point of view, Darcy’s Passions. As I read it, however, I found myself being less enthusiastic about it. On the micro-level, Jeffers doesn’t always seem in control of her word choice — as if she’s using a thesaurus too much. On the larger level, it seemed completely unoriginal, like other Austen rewrites I’ve read before. After a while I started to wonder if this book were plagiarizing someone else, because it felt so familiar to me. When I got to a particular plot point involving Anne De Bourgh, I knew that I had seen this plot before. I started rummaging through my collection of other Austen rewrites when I figured out what was going on: I had read this book before! It used to have a different cover. I’ve never been so embarrassed for myself! How could I get a third of the way through a novel without realizing that I had already read it relatively recently? 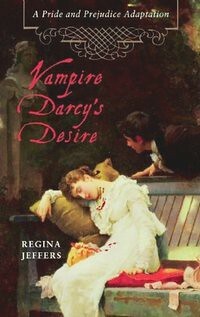 I still like Vampire Darcy’s Desire better than Darcy’s Passions, but the latter is also a good, solid rewrite of Pride and Prejudice. I intend to check out Jeffers’ other books soon, especially Darcy’s Dreams and Wayward Love: Captain Frederick Wentworth’s Story. Thanks for the very detailed and thoughtful review. This one is on my TBR pile. It is encouraging that you enjoyed it. YOU READ THE BOOK BEFORE BECAUSE IT WAS ORIGINALLY SELF PUBLISHED. THAT IS WHY IS SEEMS FAMILIAR. I hope it’s now getting a wider readership — I definitely enjoyed it!